Villa Manolis is located in the little village Adèle, with strong growth and significant tourism infrastructure, built in the plain, between olive and other fruit trees, only 8 km from Rethymno and 1,5 km from the sandy beach in Adelianos Kampos. There are 2 independent villas, Villa Manolis (10 pers) and Villa Eleni (5 pers) with beautiful gardens, built in 5 acres of private olive grove at a big distance from each other with a large communual swimmingpool, which also has a children’s section. The view from the traditional villas is fascinating as ahead lies the largest olive grove of Crete and Psiloritis, the highest mountain of the island. The closest beach in Adelianos Kampos, is at only 1.5 km, a vast sandy beach with shallow waters, awarded with a Blue Flag. Perfectly organised coastal tourist resort, with many sun beds, umbrellas, changing rooms, showers, lifeguards, beach bars, restaurants and water sports. Rethymno is the third largest city of Crete and combines everything a visitor may ask for, amazing beaches, the unique Psiloritis mountain, breathtaking canyons, the famous Old City that connects the Venetian era with modern pace of life and the Fortezza. 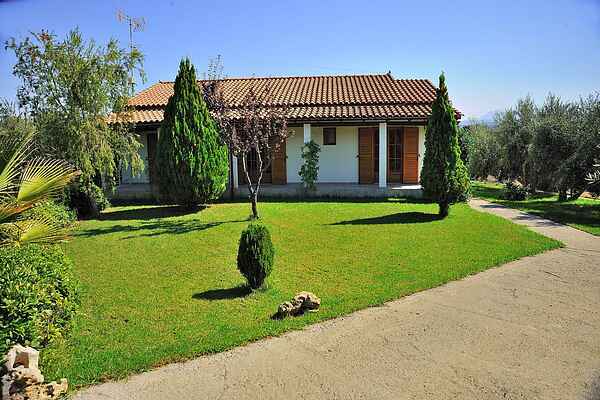 The villas, together, can accommodate up to 13 persons and are ideal for large groups or for 2-3 friendly familiies! Also the fact that you can rent both villas together offers you the advantage of both having vacations with friends and having your private place for you and your own family! Also the view from the traditional villas is fascinating as ahead lies the largest olive grove of Crete!